This is a subject that can turn common sense reality upside down. I didn’t know exactly how much until I looked deep into it. Richard Feynman was right to say “if you think you understand quantum physics then you don’t understand quantum physics”. He explained that the mysteries of quantum physics can all be seen in the double slit experiment. Being a genius, he probably understood the implications of this experiment, before further more elaborate experiments showed how weird the quantum world really is. We know that photons are particles thanks to Einstein and his Photo Electric Effect (but this also applies to Electrons, Protons and even Molecules), and this is unusual because in the double split experiment they act like waves (See image below). So, OK that’s also fine because I can imagine that particles at that scale can interact and somehow have a wave character, After all water waves are made up of water particles and sound waves are made up of air particles. Then we find out that if we send one photon at a time through the double slits you still get a wave pattern. This is getting a bit weird because it means one particle interferes with itself to create a wave. How can that be, it’s a particle. It has to go through one slit or the other. So we put a detector in one of the slits to find out. What happens? it starts acting as a particle and you get two lines of light on the screen (See Image below). Still that can somewhat be explained by saying a particle changes into a superposition state, where the particle becomes a non existing mathematical probabilistic wave function, and somehow, as a wave, it goes through both slits and interferes with itself and shows a wave pattern. When a measurement device is put, this collapses the wave function, it into a particle and thus the pattern changes to show two lines on the screen for two slits reflecting its particle character. Weird, but still acceptable as a phenomena of the quantum world. Now the part that gets me. It has been proven through many experiments that, It’s not the measuring device that interferes and collapses the wave but the preemptive knowledge of the observation, making the particle go through one slit or the other. What this means is, the wave collapses if you are, in the future, going observe it. This has been proved through a modified double slit experiment called the “Delayed choice quantum eraser” which was first conceived via a thought experiment, by J. A Wheeler a famous physicist and set up in a real experiment first performed in early 1999. It has since been replicated by many others (See image below) and proved to be correct and an accurate description. In John A. Wheeler own words “Thus one decides the photon shall have come by one route or by both routes after it has already done its travel” The implications of this is unimaginable. It basically signifies that, at the quantum level there is no such thing as the future or the past. 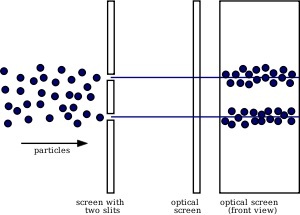 By consciously observing which slit the particle (Photon) has, in the past, gone through, the past accommodates for this and the photon behaves like a particle, and not a wave, as if it knew in advance you were to observe it. The conclusion is: what we call reality, at its basic components, is NOT REAL, but POTENTIAL POSSIBILITIES, until its observed. This also implies that there is a self-aware mathematical form beyond space-time and observation which connects all things and is affected by consciousness. The next question would be, what is conscious? You know, this reminded me of many different original, as well as thought experiments I saw in Feynman’s Lectures on Physics, and your clever reference to his quote at the beginning of the article set the tone nicely. I found your blog since you liked a post on mine, and I must confess, yours is absolutely amazing in terms of its quality of material and its ability to provide endless food for thought. I clicked Subscribe after reading just one article! Great work, would love to read more!